FUN RUN/WALK 2018: On Monday, New Year's Eve, Kilkee Sub Aqua Club will host a 5k/10k walk and run. Participants should register on the day by 11.30am. The even commences at midday. Registration (€10) is at the Bandstand, Kilkee. Proceeds are for the Kilkee Sub Aqua Club Search & Recovery Unit. Please support. Pool Training 2018: Pool training for trainee divers commenced in Shannon Pool for the 2018-19 season in November and continues every Monday night from 8pm to 9pm until March. If you wish to take on the exciting pastime of scuba diving, full training is provided, first in Shannon Pool and then in the sea from March 2018. Get in touch with any club member, for further details. 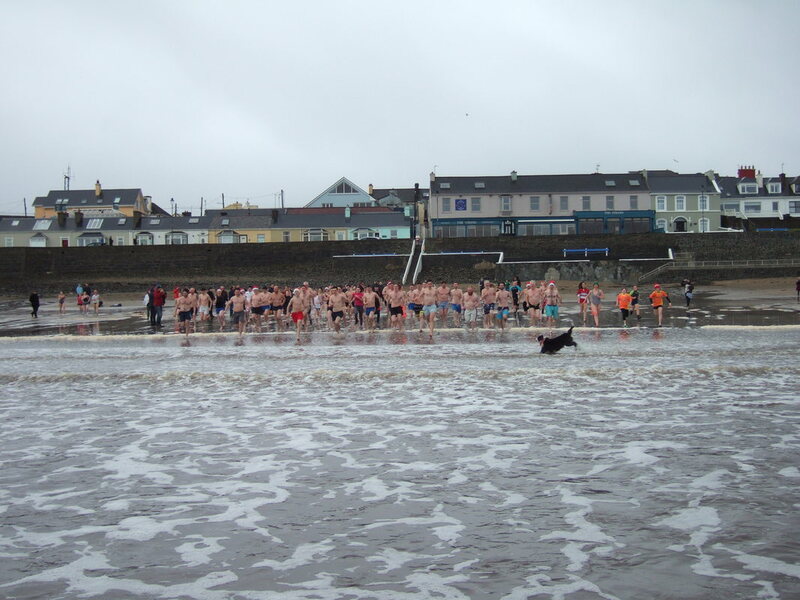 Christmas Day Swim: Kilkee's annual Christmas Day swim is one of the club's fundraising highlights and a great way for people in the community to get involved in a fun activity. 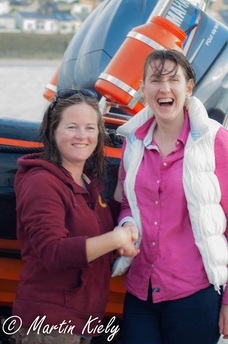 Proceeds from the sponsored swim go to Kilkee Sub Aqua Club's Search & Recovery activities. Club Diver: Vanessa Keane, shown on the left in the picture, being congratulated by her instructor, Mary O'Malley, Aughinish Diving Club, on successfully completing her Club Diver test. KSAC NOW AGED 36 AND COUNTING: Kilkee Sub Aqua Club will celebrate its 40th anniversary in December 2022 with past and present members. For many, 1983 didn't seem so long ago. OILEAN NA BATHA: Oileán Na Bátha- Place of Mystery, Tales of Survival: Article by the late Noel Gleeson. GALWAY RECOMPRESSION CHAMBER: The Recompression Chamber (RCC) in University College Hospital, Galway (UCHG) is the closest facility for emergency treatment of divers and is run on a voluntary basis by members of Galway Sub Aqua Club. The Chamber is available 24/7 for emergencies. Divers, DOs, DODs etc. who suspect decompression illness should contact the Coastguard (999/112 or Ch. 16) as soon as possible and request recompression treatment.